Simply put, it is a movement whose aim is to use technology to fundamentally change the human condition, to improve our bodies and minds to the point where we become something other, and better, than the animals we are. It’s a philosophy that, depending on how you look at it, can seem hopeful, or terrifying, or absurd. 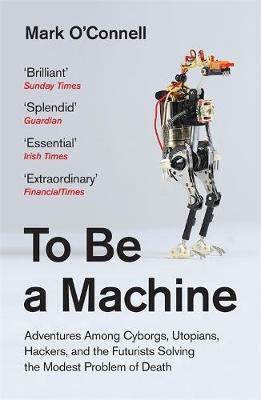 In To Be a Machine, Mark O'Connell presents us with the first full-length exploration of transhumanism: its philosophical and scientific roots, its key players and possible futures. From charismatic techies seeking to enhance the body to immortalists who believe in the possibility of ‘solving’ death; from computer programmers quietly re-designing the world to vast competitive robotics conventions; To Be a Machine is an Adventure in Wonderland for our time. A stunning new non-fiction voice tackles an urgent question… what next for mankind?